Take 1 capsule per day with a meal. If pregnant, nursing, using any medication or have a medical condition, please consult a qualified health care consultant before using this product. WARNING: KEEP OUT OF THE REACH OF CHILDREN. Accidental overdose of iron-containing products is a leading cause of fatal poisoning in children under six. In case of an accidental overdose call a doctor or poison control center immediately. to the stomach because it dissolves in the intestine. 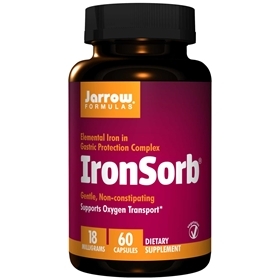 Iron is an essential trace mineral required as a component of hemoglobin and myoglobin for transport of oxygen to tissues. Supplemental iron is essential during pregnancy and for many teenage males and females. Adult males and post-menopausal females should consult their physician before taking supplemental iron. Cellulose, silicon dioxide and magnesium stearate. Capsule consists of hydroxypropylmethylcellulose. no fish/shellfish, no nuts/tree nuts.